"This little book fills a long-felt want. It is the only publication, we believe, which deals with the subject of the novel presentation of your card to agents, bookers, etc. 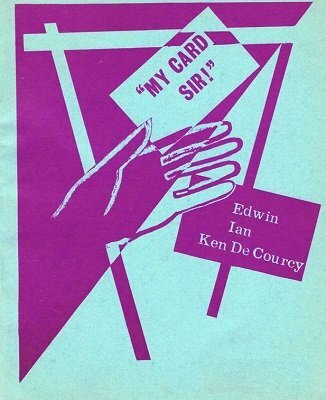 May many bookings follow the presentation of "your card". Imagine you're in a club, pub or other hostelry where people meet to drink, eat and be merry. You're ready to perform and need an audience. If you have a couple of friends with you there's no problem. Simply get cracking and, if your magic's good enough, a crowd will soon gather. But let's assume you walked in alone, sat at a table of strangers and joined the conversation, which is almost certain to be about high prices, politics, gambling, sport or women. QUESTION: How do you introduce Magic into the session without making it obvious that was the sole reason you joined them? "So that's what this is all about, the magical presentation of your business-card in an interesting and apparently impromptu way. Boiled down, if you work for money this whole operation is to obtain added bookings, and we'll assume that's why you're reading this. Once you've opened with one of the methods we'll describe, move into a short startling sequence of what appears to be impromptu magic and finish on the highest note." 1st edition 1980, 1st digital edition 2014, 16 pages.